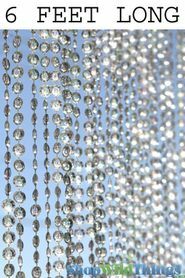 Our Grand Chelsea crystal swirl chandeliers are so sparkling with 2 tiers and 200 strands of sparkling, spiraling Diamonds Crystal Iridescent Beads. 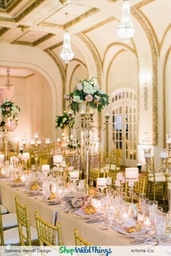 Many of our breathtakingly beautiful Grand Chelsea Chandeliers have been used for very famous venues. 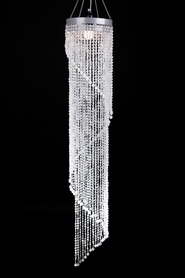 Full strands of acrylic crystal beads drape from the top in a graceful swirling fashion. You can create glittering, shimmering columns out of thin air with our exclusive Grand Chelsea chandeliers. 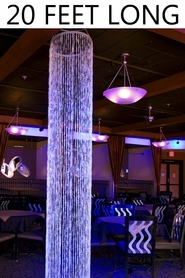 It's the queen of all chandeliers at 10 feet in length and 2 feet in diameter and features 2 tiers so that the look is very full! 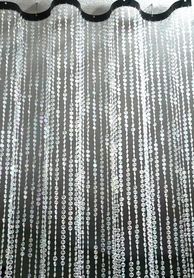 Make sure to check out the photo of the top of the frame below. 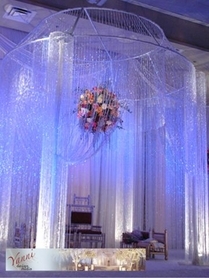 Clients will be awed! Guests will be dazzled! 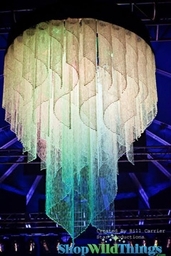 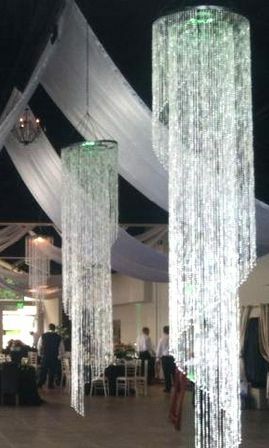 This chandelier will make your event planning simple. 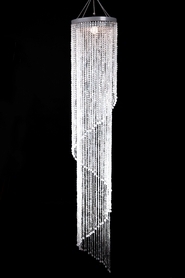 We have matching beaded curtains and columns to coordinate with this magnificent chandelier. 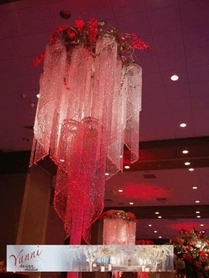 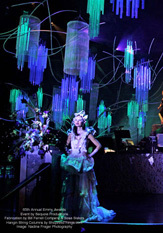 Flood the chandeliers and harmonizing products with colored light and voila -- you have color-coordinated chandeliers, beaded curtains and columns for any event. 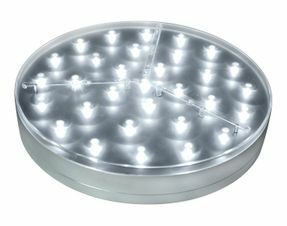 If you do want to use an electrical cord kit with a light bulb, we sell the cord here - Light Cord Kit. 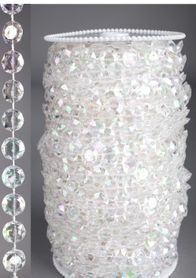 The center of the chandelier already has the hardware needed to hold the light kit in place or you can also insert your own string of lights through the center. 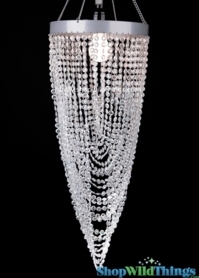 Shop our remote lighting systems to cast a spotlight on this spectacular chandelier. " 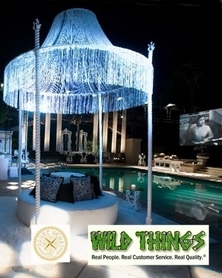 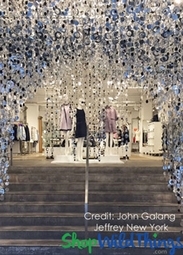 We at shopwildthings.com are so thrilled to bring this innovative product to market, filling the need for a large, versatile and easy-to-install chandelier at a price that will fit your your budget. 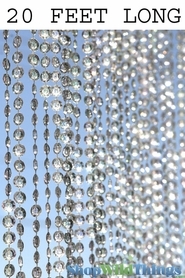 We designed our gorgeous new chandelier to hang easily from one S-Hook. 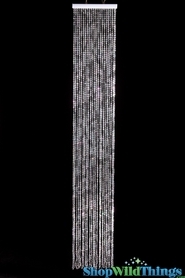 Use over and over. 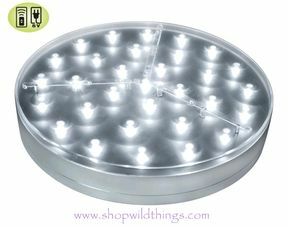 To store, collapse and place inside a 25-inch by 25-inch by 4-inch box for safekeeping between events. 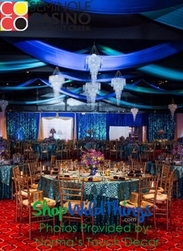 Create more flair with our matching beaded curtains and columns for that next gala. 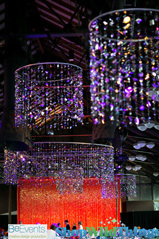 Visit our Decor Photos ; Ideas page to see a photograph of the use of our Chelsea chandeliers for the film Sparkle. 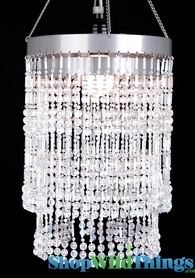 Click on our video on this page for a great demonstration of the three sizes we carry in these gorgeous chandeliers.